the readings are repeatable each time and precise. The granuality of readings is in 0.1 Kg. I highly recommended this for all weight watchers. Do click helpful if you found what you needed! Now I'm a very skeptical person when it comes to online shopping. If possible I would love to stick to brick and mortar stores. Alas! Not possible on this fast paced life. So it's either Amazon or its top Indian Rival FK. More Amazon, because of ease of use. So I ordered a manual weighing scale first, as I grew up seeing that one. And the durability factor too. But I had to get it replaced and eventually return due to Zero resetting issues. So then I bought the digital one as recommended by some friends. Then I used it a few times and my weight looked accurate. Then I tested it and found that I had to switch off switch on every time I need to use it. Normally we just turn the switch on. And then it automatically shuts off after a few seconds and turns on if we stand on it to check our weight. I tried but it did not turn on. So I decided to return it. Created the return. Printed the return label too. Then the next day when I wiped it and was about to repack, I decided to check weight one last time. Incidentally l just placed it on the floor and stood upon it. And voila! It turned on! And I realized my error. I had been testing its auto turn on with one leg or by pressing with hands only!! So then I hastily cancelled the return and decided to keep it. It's about 100 bucks cheaper than the manual one too. In this case at least, it looked cheap, but worked fine as expected. A white glass, plastic & steel weighing scale that uses a 3V coin battery. The glass is thick & tempered, affixed with steel studs onto a sensitive weighing mechanism. 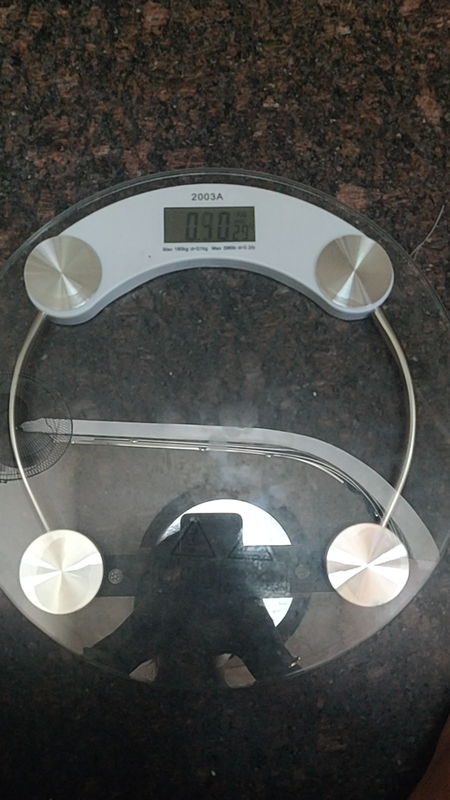 Weight is accurate to 4 digits after the decimal. Looks sleek in all white, glass & steel, matches my room decor. It's slim so can be kept anywhere, really helpful in monitoring weight. Weighs accurately & you just need to step onto it unlike older ones which you needed to press start first. Battery came pre-installed. The glass & build is good, durable & will be good for years. Overall a good experience. I am looking for a weighting machine and I got this and I am so satisfied with this product and I recommed you For accurate measuring please keep weighing scale on flat surface and wait for 5 sec then place your feet in centre of weighing scale and at this price it is worth to buying it. This is highly accurate, stylish and classy weighing scale bought till date. Checked for it’s accuracy nearly 5 times and the readings were accurate without any fluctuations. The tempered glass is of very good quality and can withstand weight more than100 kg. Quite reliable piece. So if you plan to manage your weight, there is no better option than having this in your household. Recommended to all! 5.0 out of 5 starsVery accurate and good looking. So i can see my progress. And i was very surprised. Because it always show me accurate result. And helped me so I can gain desire weight. 1. Super light as mentioned in the product description. 2. Big display. You can read the digits from 6-7 feet, if you are that tall. 3. Sturdy. The glass is very high quality and very strong. 4. It's got a nice design and finish which makes it look premium. 5. It's pretty accurate showing weight till first decimal point. Nothing. But use it carefully. Recommendation: yeah this product is really good to buy. It is an amazing Product for the daily use. The glass was tough and can't break that easy. The design of the this was superb. It can take weight up to 180kg. The best features it have is auto power on and off feature. You should buy if if you are searching for a Weighing Scale.